Their marriage haunted by an earlier tragedy, middle-class couple Jason Bateman and Rebecca Hall move to L.A., where they meet a chummy former school acquaintance(Joel Edgerton) of Bateman’s whom he only remembers, disparagingly, as “Gordo the Weirdo”. Unwanted gifts and awkward “dinner parties” follow and Bateman insists Edgerton is a creepy fucker with an obsession for Hall. 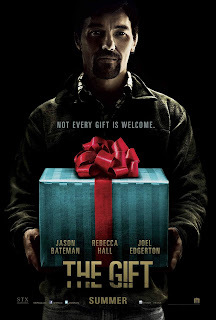 For a while, you may think THE GIFT is a straight-forward thriller in the vein of all those early 90’s Hollywood suspensers in which well to do families are threatened by homicidal babysitters / cops / landlords / etc. Edgerton’s script cleverly flirts with the conventions of this sub-genre (including the apparently imperilled pet dog) but unfurls into something far more unsettling and unpredictable. Clever casting neatly subverts Jason Bateman’s established amiable screen presence, as grim secrets are revealed until a climactic “gift” hits like a sledgehammer. A rare non-violent yet disturbing modern day thriller, it has the courage of its convictions and bows out on a marvellously sour note. The three central performances are excellent, with the underplaying, layered Edgerton a stand-out in the film he wrote and directed under the “Blumhouse” banner.